There is not much to report here outside of a dog giving its human a ride in my bakfiets. 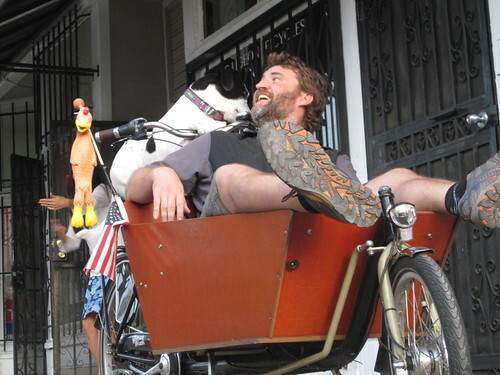 The dog is Bixby who has been navigating for her human as they make their way across the country via Yuba Mundo cargo bike to raise awareness about pet adoption. Bixby, like any 21st Century pooch, is fully connected to the internet with her own web-site (WheresBixby.com), Twitter account (@wheresbixby), and Facebook Page. Bixby and her human visited our shop a week ago to ride in CicLAvia in South LA. It was great to talk about all the wild adventures the duo had in making their way across the country and Bixby was so patient with us humans. 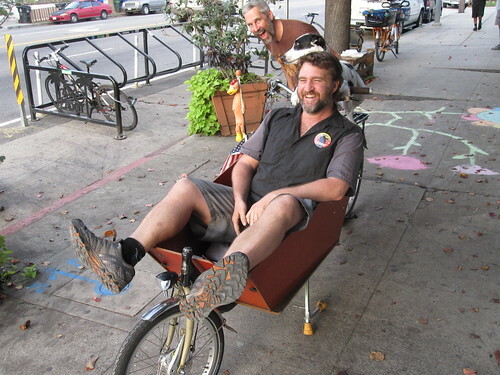 Bixby’s adventure on a Yuba Bicycle made us seriously reconsider carrying these rear-loading cargo bikes in our shop again. So, what do you think? Are there people in LA looking for a Yuba?